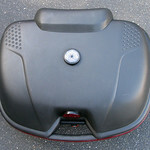 About a month ago, I read a post on ADV about Sears carrying a Givi-style luggage box. 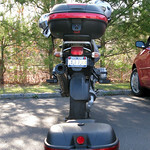 Givi’s boxes are terrific but coupled with their separately purchased mounting plates, they’re pricey. 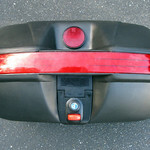 We currently have the E460 mounted on Kenny’s GS. I believe the price tag on it last year was around $200 + $75 or so for the mounting plate. Though I love the top box and it’s dry, lockable storage capacity, I think that’s a lot of dough. With that in mind, I passed the Sears link along hoping that someone I knew would be able to make good use of it. Well, we got a bite. My friend Bill ordered the large box for his WeeStrom. It came in at the whopping price of $55 for the box and included the mounting plate. Though there is no mention of branding on the website, the top box that came from Sears had JC Whitney part numbers and packing materials. The Sears box is identical to the ones currently listed on the JC Whitney website, but sells for less money. Two snaps up, a twist and a kiss for the internet. The JC Whitney site currently has about 90 reviews listed on this trunk. Maybe they can help you determine if it’s a good deal for you too. Have you had any experience with the JC Whitney/Sears trunk? Tell us about it! 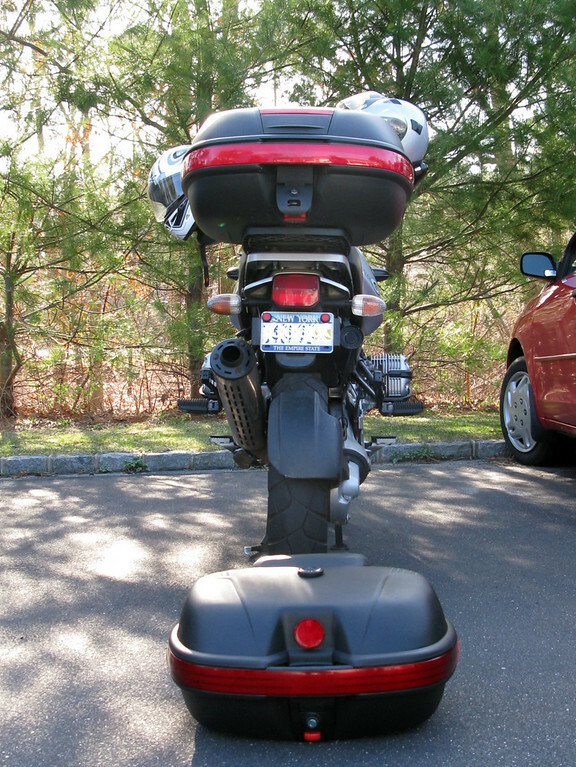 Comparing that box against the Givi, it is IDENTICAL. Hinges, latch, internal molding, the works. Such a great deal! I took the plunge and ordered the large sized trunk from Sears. I will update with my impressions after it arrives. What kind of bike are you mounting it on Kevin. I believe that you should throw their hardware out & go to the hardware store for the stainless steel stuff. Cost me about 4 bucks. I’m mounting on a Suzuki GS500. 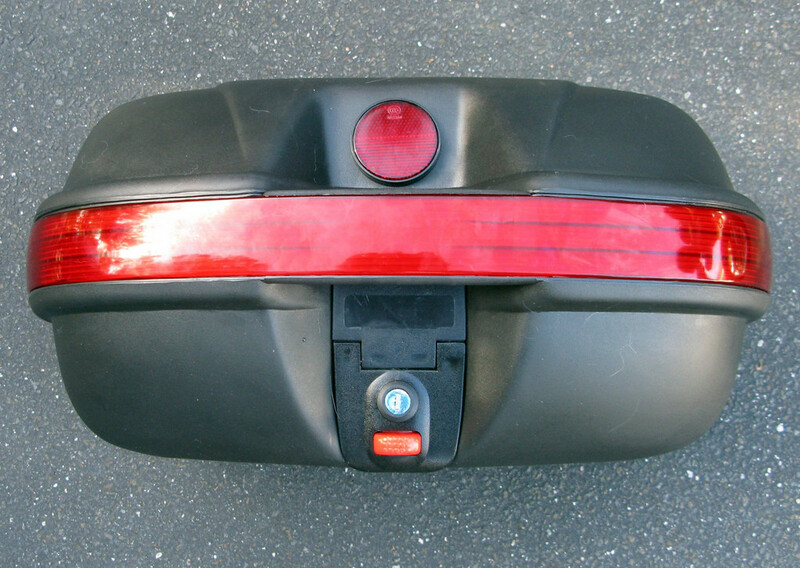 I’m trying to track down an original tail rack that Suzuki made for the 2002 model year. Was it easy to make the mounting plate yourself? Word Fuzzzzzzz! Just ordered the medium for the monster. Figure out how to rig it up will prob cost me more! I couldn’t pass up this deal so If I can’t rig it it will just go on my gs800 when i get it. Thanks for the heads up! Nice, Arc! You’ll have to put up some pics once you get the mounting on the Monster worked out. I hope you come away with a good experience with it! 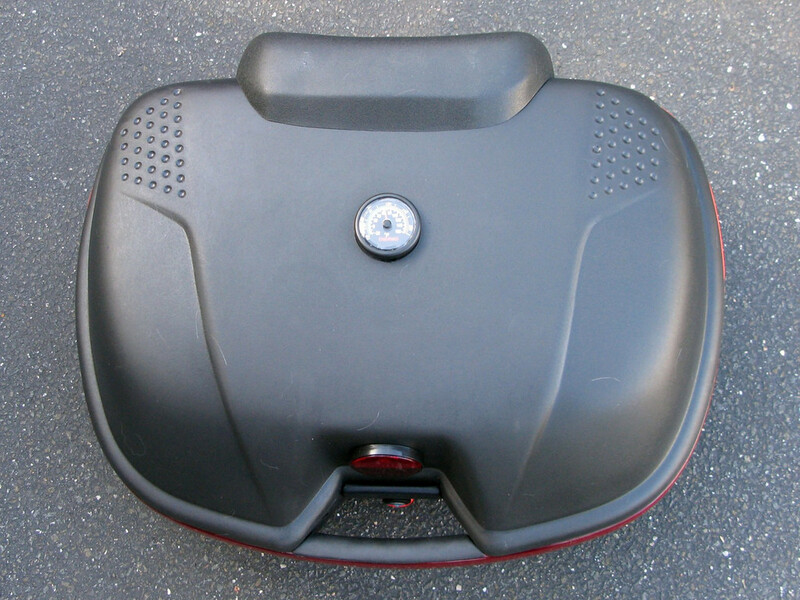 I purchased the medium sized case for my 06 Triumph Tiger 955i, and when I met up with a bunch of other European motorcycle enthusiasts for breakfast, a friend compared his Givi to my Sears special, and was very disappointed that they’d spent so much for a brand name. They really are the same case. That’s awesome, Jane. Glad to hear you’ve had a good experience with yours!